Licensed Practical Nurses (LPN) provide nursing care and support for RN/Physician staff in the hospital/or skilled nursing facility. They may also assist with the care of children, new mothers and infants. 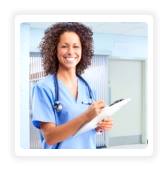 The licensed practical nurse works under the supervision of a registered professional nurse; in a hospital setting, they may share many of the same responsibilities such as: direct patient care, medication administration as well as documentation. Through classroom study, laboratory exercises, and clinical experiences in diverse health care settings, students acquire the knowledge, attitude, and nursing skills needed to be successful in their profession. Students learn about nursing theory, body structure and function, administering medication, medical/surgical nursing, maternity, OB, and geriatrics. In our practical nursing program, you’ll gain real-world skills in a supportive environment from experienced nurse faculty in small class sizes. Practical Nursing (PN) program makes it possible for students to earn a diploma degree in practical nursing and become eligible to take the NCLEX-PN exam in about one year.